U kunt in totaal maximaal 15 reizigers selecteren. Tijdens deze tweedaagse tour door St. Petersburg maak je kennis met de stad, haar geschiedenis en haar cultuur. 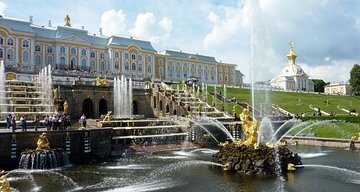 Bezoek Catherine Palace, Peterhof Garden (Petrodvorets), het Rasputin-museum in het Yusupov-paleis, de Russisch-orthodoxe Petrus- en Pauluskathedraal en de Izaäkkathedraal. En ga op een kanaal- en rivierboottocht en krijg vroegtijdig toegang tot The Hermitage. 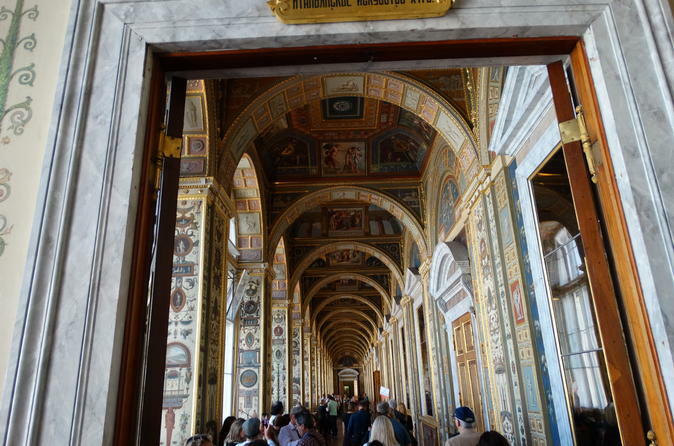 The tour visited many of the popular destinations in St. Petersburg. We saw all of the important sites and the tour guide was pleasant and informative. All of our group enjoyed the tour. Our tour guide Katya and our driver exceeded our expectations from start to finish. Our entire 2 day tour went flawlessly and the knowledge Katya shared with us made our trip! I would highly recommend this tour company. There is no way you could see all that is included on your own! Very well organized, superb English and great use of time. Two full days of outstanding stops. WiFi on the bus, early entry into Hetmitage and skip the line status really enhanced our experience. Alassandra was an outstanding guide. Can highly recommend this 2 day tour which included all the main attractions in this magnificent city. Our guide spoke excellent English and was very informative and efficient. Managed to get us around the Hermitage backwards (against the rules!!) which resulted in less crowds and a more relaxed tour. We chose this tour after all the positive reviews we saw on Trip Advisor, and we were thrilled with our experience. Our tour guide Olga and our driver were awesome. Olga was very informative, organized, and professional, yet she was also light and humorous, and made the tour so much fun. The tour included a really nice lunch at a restaurant one of the days and a packed lunch the second day. Our family of 4 saved hundreds of dollars per person over the tour the cruise ship offered, we had a much smaller group (16 people), and saw more than the tour offered by the cruise ship. We highly recommend Alla Tours and Viator! We just returned from a 24 day cruise on the Zuiderdam. We booked this tour through Viator.com but they hooked us up with Alla Tours. We were so happy to have Julia as our tour guide and Dimitrie as our driver. We had a small group of 14 people, which made it much more personal. We covered everything the tour says it will plus more, I believe. This is an outstanding value. Julia was extremely knowledgeable about all the sites we visited and kept us on schedule. Thanks again, Alla Tours, for making our visit to St. Petersburg a great memory. I'm normally quite conservative in my reviews but in this case I can't find enough superlatives. We were a little worried about the visa waiver particularly as our cruise ship company insisted we wouldn't get ashore unless we booked through them. As it transpired the excellent pre-departure support of the tour company and their first class representatives at the Port ensured that everything went as smooth as clockwork. Incredibly efficient as well. The visa waivers came through within minutes of booking! The tour itself was fantastic. It covered practically every major sight, was truly all-inclusive, and the tour guide Alexandra was attentive, charming and very well informed. She clearly enjoyed her work and her enthusiasm was infectious. I had to conclude that this was the best organised tour that we had ever been on. Congratulations an absolute pleasure. A great 2-day tour plan, the tour lady and driver were very knowledgeable and friendly. we enjoyed tour very much! This shore tour is an absolute must for everyone cruising into St Petersburg. It is very well organised and our guide Alex was amazing, he gave us an insight into life as it is today as well as the history of Russia and kept us entertained all day. We had 16 in our group which made the whole experience more comfortable, personal and enjoyable. The bus was comfortable and we all felt very safe travelling through the city. The museums, cathedrals palaces and gardens were spectacular, St Petersburg was definitely the highlight of our Baltic cruise. The tour guide was excellent but two issues stood out that caused the three star rating - 1. There were too many people on the bus, more than the 16 stated as a max, causing some to sit in the far back without windows. If you can't see out it greatly diminishes the joy of touring! Tour promised early admission to the Hermitage but due to so many cruise ships being in port we visited in mid afternoon and the museum was totally packed. It was not the experience we were promised or looking forward to. According to the tour, it was out of our control. Deliver what your promise.